Eye drops can treat a range of eye problems. For instance, you may use prescription eye drops from your doctor to treat an infection, a minor eye injury, or a condition such as glaucoma. Or, you may use over-the-counter eye drops to relieve dry or red eyes. Depending on why you’re taking them, you may need to use eye drops for a short time or for a longer period. No matter your reason for using eye drops, it’s important to use them correctly. The proper technique helps the medication absorb into your eye so the drug can do its work. 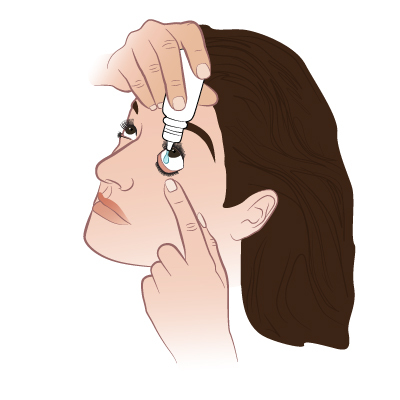 Here are step-by-step instructions on how to use eye drops properly and easily. In addition to your eye drops, you’ll need hand sanitizer or soap and water to clean your hands. You may also need some tissues to wipe away excess drops from around your eyes. These instructions can help you put eye drops into your own eyes. If you’re a parent or caregiver, these steps can also help you give drops to another person. If you have trouble putting drops into your own eyes, ask a family member or friend to help you. Gather your supplies. These include the bottle of eye drops as well as a tissue or other cloth to wipe away excess drops. Wash your hands with soap and water and dry them with a clean towel or a paper towel. If soap and water aren’t available, you can use hand sanitizer instead. If directed on the label or by your doctor or pharmacist, gently shake the bottle. Remove the cap from the bottle and place it on its side on a clean surface. Check the dropper tip to make sure it’s clean. If it’s dirty, throw the bottle of drops away and get a new one. Tilt your head back or lie down flat on your back. 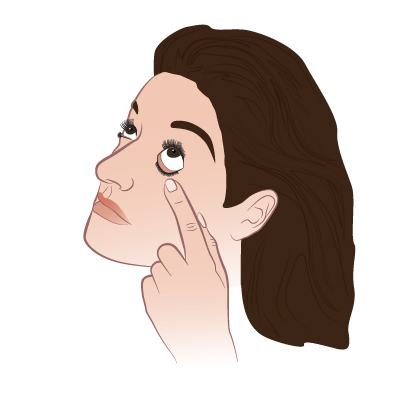 Pull your lower eyelid down with your finger to form a pouch or pocket where the eye drop will go. Hold the bottle over your eye, with the dropper tip facing down. The dropper tip should be as close to your eye as possible without touching your eye. You can support the hand that’s holding the bottle by resting your wrist against your forehead. Look up. Squeeze the bottle so that a single drop falls into the pouch you made with your lower eyelid. Close your eye gently and tilt your face toward the floor for two to three minutes. Try to avoid blinking, moving your eyeball, or squeezing your eyelids tightly shut. 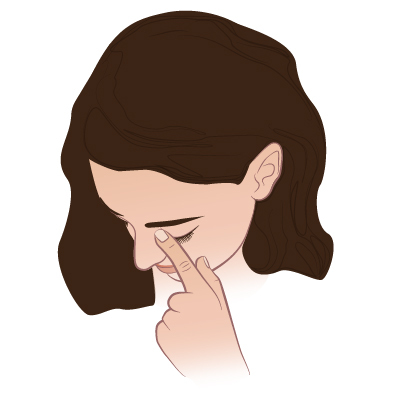 While your eye is closed, use one finger to apply gentle pressure to the inside corner of the eye. This stops the medication from draining into your nasal passages and getting into your mouth or throat. Use a tissue or other cloth to wipe away any excess liquid from around your eyes. If you need to put a second eye drop into the same eye, wait at least five to 10 minutes after putting in the first drop. Put the cap back on the bottle. Don’t touch the dropper tip or try to clean it. Wash your hands to remove any medication that got on them. Store the bottle as described on the label or by your doctor or pharmacist. Do know how long your eye drops can be safely used once you open the bottle. For prescription eye drops, ask your pharmacist about the expiration date. For over-the-counter drops, check the expiration date on the label. If you’re using two types of eye medications, do use them in the proper order. If you’re using both an eye solution and an eye suspension, use the solution first. Then use the suspension. Your doctor or pharmacist can tell you the difference between these types of medications. If you’re using eye drops and an eye ointment, use the eye drops first. Then apply the ointment at least 10 minutes later. Do understand it’s normal for some liquid to flow onto the skin around your eyes after using an eye drop. This does not mean you need another drop. Don’t allow the dropper tip to touch your eye or any other surface. If the dropper tip touches any surface, it could pick up bacteria or other germs that could cause an infection in your eye. Don’t wear contact lenses while applying medicated eye drops unless your doctor or pharmacist says it’s okay. Wait at least 15 minutes after using the drops before putting in contact lenses. If you’re using moisturizing eye drops for use with contacts, though, you don’t need to wait. Don’t share eye drops with another person. Sharing drops could spread germs and infection. To help your eye drops work well, follow these instructions and any directions from the eye drop label or from your doctor or pharmacist. These steps should help you use your prescription or over-the-counter eye drops easily and safely. If you have any questions about using your eye drops, ask your doctor or pharmacist. My eyes hurt after I put in my eye drops. What should I do? Some eye drops will make your eyes burn or sting when you first put them in. That’s usually not a concern. However, if the discomfort doesn’t go away in 10 to 15 minutes or if it keeps getting worse, you should call your doctor. You should also call your doctor if you have any swelling in your eyes after you use the drops.